Do you ever go out to eat and can’t decide what to get? You sit there for 20 minutes going back and forth between two different options, and suddenly a third option comes into the picture making it impossible to make a decision. Maybe that’s just me, but I’m a little crazy anyway. When I go to my favorite restaurant, Longhorn Steakhouse, there is no question what I am going to get: STEAK. Obviously. And a couple sweet potatoes on the side. When I first started off in the weight room, I was that guy who was at a random restaurant and didn’t know what he wanted. Now I'm that guy at Longhorn Steakhouse, and I know exactly what I want. As you may already know, I compete in Strongman Competitions. I used to train for football, but now I train to lift weights. Training for football still requires lifting heavy, but training for a competition requires heavy lifting in specific ranges of motion. Football was not my Longhorn. It was more of like a Red Robin to me. Don’t get me wrong, I love and miss Red Robin, but Longhorn stole my heart. At Red Robin my go to is a bacon cheeseburger, not a steak. That’s because a bacon cheeseburger at Red Robin is better than their steak. But now I’m at Longhorn. My point here is that when you are at different restaurants you order different things. Same concept when it comes to training. You do different training and diet programs when it comes to training for different end goals. Squatting, it’s like brussels sprouts. Whether I’m at Longhorn or at Red Robin, I’m not ordering them. People might say they're good for you, but it’s just not worth choking them down anymore. It fills me up and takes up room in my stomach. Valuable room in which could be replaced with high quality nutrient dense foods. Squatting hurts my knees, and if I ignore the pain and fight through it...it travels to my hips. This negatively affects my other lifts, both in quality and volume. I bet you are sitting there and thinking how the hell did this guy become the national champion strongman? I got strong and efficient in specific movements. Not one event in strongman requires you to squat or have your femurs at or below 90 degrees. I have tried, and I am still trying, to bring the squat back into my training. I squat light and do single leg exercises to maintain full range of motion strength and to stimulate hypertrophy. Maybe bench press is your brussels sprouts. Your best bet would be to work the same muscles, but shorten the range of motion. Floor press would be the deadlift to a squat; shorter range of motion but, working similar muscles. Unless you are a competitive weightlifter, there is no problem. There is always an alternative. Whatever lifts you choose to be your staples, make sure you can attack them day after day and remain pain free. Accumulating volume is the secret to strength, but accumulating the volume in a safe and efficient way is the hard part. Being able to dial up or dial down frequency and intensity at the right time is always crucial. As long as you know what your end goal is, the process will be that much easier. Find your favorite restaurant, and go get steak every night. How do you know if certain lifts are a bad idea? You just know. You know that the kid in the squat rack going down a quarter of the way isn’t onto something. You know the guy in his 50’s screaming to get an extra rep on bench probably is not onto anything either. If it looks and sounds bad, no doubt it's bad. Just go ahead and watch this clip of the world record clean and Jerk. It looks effortless and beautiful and he’s petting 533lbs over his head. What's your steak and potato exercise? What's your brussels sprout? Drop us a line below and let us know! 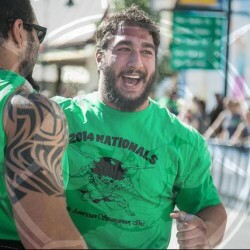 Zach Hadge is a World Champion strongman, Super Mario Bro extraordinaire, and overall monster in both training and life. He’s here to show you the doors, to tell you when its time to grease the hinges, pick the lock, find a new door, or just bust the door down completely. The only other thing he asks for in return is effort. Follow Zach on Instagram (@hadge_brothers) for all the latest happenings.